Arabic gum was purified and used as modifier of carbon paste electrode (PAG-CPE) for the simultaneous determination of quercetin (QT) and rutin (RT) in 0.1 M phosphate buffer solution, pH 6.0. Fourier transform infrared spectroscopy was used for the identification of different chemical functional groups present at the surface of the raw and the purified arabic gum. The electrochemical behaviour of QT and RT on the modified electrode was studied using cyclic voltammetry (CV) and square wave voltammetry. The sensitivities of PAG-CPE for both QT and RT were respectively 2.8 and 3.3-fold greater than signals obtained on the unmodified CPE in CV. The linear dynamic range for both flavonoids was found within the concentration range of 0.099–1.090 µmol/L with a detection limit of 0.029 µM and 0.058 µM respectively for QT and RT (3S/m). The proposed approach was successfully applied, first for the direct quantification of QT and RT in crude natural fruits and secondly, for the simultaneous detection of both flavonoids in human urine. The online version of this article ( https://doi.org/10.1007/s42452-019-0413-8) contains supplementary material, which is available to authorized users. Flavonoids are polyphenolic compounds commonly found in vegetables, fruits and variety of beverages, which constitute a significant part of the human diet. Rutin and quercetin belong to the flavonoid family and were recognised to be the most abundant natural flavonoids . In the past few years, rutin and quercetin have received considerable attention due to their beneficial effects on human health . Quercetin is used for reducing the risk of disease and some forms of cancer, and also for the protection of human DNA from oxidative attack in vitro . Rutin has many pharmacological and physiological proprieties, such as anti-oxidation, anti-inflammatory, anti-diabetic, anti-adipogenic, and anti-tumour activities. Because of their wealth in flavonoids and their availability on the market for the whole year, apple, orange and onion are regularly used as matrix for the investigation of both rutin and quercetin . In fact several methods were reported for the determination of flavonoid compounds in natural sources including high performance liquid Chromatography (HPLC) , HPLC with UV detection , HPLC coupled with mass spectrometry (MS) , spectrophotometry , and solid phase extraction . These methods are highly sensitive and effective, but often require some complicated and time consuming sample pretreatment. Electrochemical methods offer the advantages such as simplicity, low cost and the possibility to construct portable devices for the determination of flavonoids. In the field of amperometric sensors, several materials have been used to fabricate modified electrodes for the electrochemical study of flavonoids. As typical examples, carbon-nanotubes were used as modifiers of a carbon paste electrode for simultaneous detection of rutin and quercetin . Liu et al. , prepared SH-β-cyclodextrin functionalized graphene–palladium nanoparticles for determining rutin and isoquercitrin. Quercetin was successfully detected in urine using 1-ethylpyridinium bromide composite modifier carbon paste electrode . In the same way, Saber-Tehrani et al. studied the determination of quercetin in foods using graphem nano sheets modified electrode. Yuan-Yuan et al. 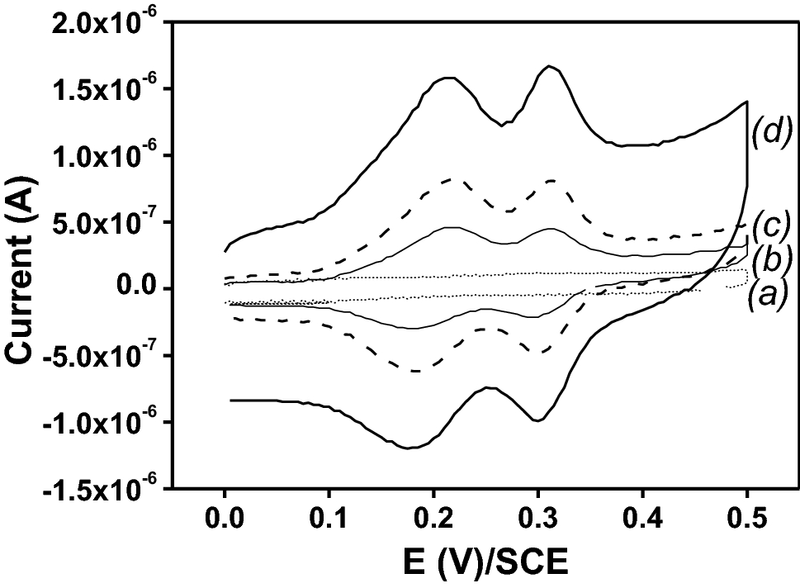 investigated the electrochemical determination of quercetin by self-assembled platinum nanoparticles/poly(hydroxymethylated-3,4-ethylenedioxylthiophene) nano composite modified glassy carbon electrode. 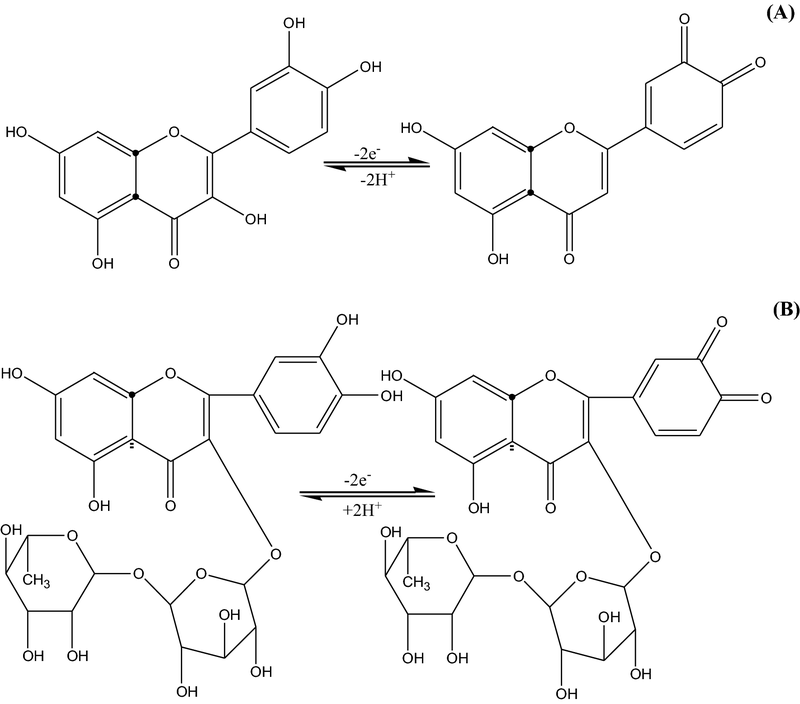 More recently, Mehmet and Necip  reported the use of gold nanoparticles involved in p-aminothiophenol functionalized multi-walled carbon nano tubes as modifier of a glassy carbon electrode (GCE) for the simultaneous determination of quercetin and rutin. Most of these materials previously mentioned are expensive and their synthesis need a lot of time. A new class of natural compounds essentially constituted of polysaccharides, bearing hydroxyl and carbonyl groups, and displaying a great affinity with polyphenols has been recently explored . Their attractiveness results from their great availability, low cost, biodegradability, and organophilic character. We report in the present study, the elaboration of a novel carbon paste electrode chemically modified with purified Arabic gum for the simultaneous determination of rutin and quercetin. The elaborated sensor was successfully applied for the direct quantification of both rutin and quercetin in different natural fruits and human urine using the standard addition method. Quercetin (QT) and rutin (RT) were purchased from Extrasynthese (Lyon, France). Stock solutions of QT and RT (0.1 mM) were prepared by dissolving 0.75 mg and 1.52 mg of the respective salts in 50 mL of distilled water. The prepared solutions were then diluted. 0.1 M phosphate buffer solution (pH 6.0) (PBS) was used as supporting electrolyte since both flavonoids bear hydroxyl functional groups in their structure. It is expected that the acidity of the supporting electrolyte affects their redox behavior. All other aqueous solutions were prepared from analytical grade chemicals, using distilled water. The Arabic Gum, selected for this study was collected from Acacia Senegal trees in Ouagadougou (Burkina Faso) and was purified before use, in order to enhance its property . In fact, the aim of this purification is to remove the extractives which may reduce its performances. The procedure used for the preparation and purification of raw gum sample was clearly described in a previous study . Briefly, raw gum was sun dried and then milled to fine powder using a mortar. The powder was sieved several times to obtain a fine fraction (0–40 µm mean average diameter). The purification consisted to introduce 50 g of powder raw gum into 250 mL flask containing 100 mL of distilled water and stirred during 24 h to ensure complete dissolution. The mixture was filtered, allowed to rest for a few minutes and the supernatant gum was precipitated by addition of 100 mL of 72% ethanol. The precipitate was recovered using vacuum filtration followed by drying in air dried for 5 days. The purified gum was then used without any further modifications for the preparation of the modified carbon paste electrode. Local fruits such as orange, apple and onion chosen for the present study were obtained from a local market in Ouagadougou (Burkina Faso). Each selected fruit was washed twice with distilled water. They were grinded and crushed in order to obtain a fine paste. The natural juice was removed from each fruit by filtration using a proper cloth and the pH was measured (5.1; 6.7 and 6.3 for orange, apple and onion respectively). 5 mL of each natural juice were diluted with 20 mL of PBS (0.1 M pH 6.0) and transferred into the electrochemical cell. Voltammetric curves were recorded using SWV technique on PAG-CPE, and the standard additional method was used for an estimation of exact amount of QT and RT in each fruit. Human urine was also used as a real matrix for a quantitative analyses of QT and RT. Since urine is a biological fluid that contains regularly flavonoids from drugs consumed by human being. Thus, a sample of urine (5 mL, pH 6.0) was diluted with 20 mL of PBS and enriched successively with 0.2, 0.25 and 0.3 µM of both QT and RT. The mixture was stirred for 2 min using a homogenizer and the solutions were then left to rest for 5 min. QT and RT extracted from spiked urine sample were determined using SWV on PAG-CPE and recovery rates were then calculated. Electrochemical measurements were carried out on a DY2300 electrochemical analyzer (Digi-IVY Instruments, USA) running with the DY2300 EN software and connected to a personal computer. A classical three-electrode cell configuration was employed, consisting of bare or modified CPEs used as working electrodes (geometrical area 0.071 cm2), a saturated calomel electrode (SCE) as reference electrode, and a platinium wire as counter electrode. The raw and purified Arabic gum were characterized by using Fourier transform infrared spectroscopy (FT-IR). The double aim of the IR characterization was first, the identification of different chemical functional groups present at the surface of powders and secondly, the confirmation that an effective purification of the raw Arabic gum was realized. FT-IR spectra were obtained by means of the ATR technique with a Bruker α-P FT-IR spectrophotometer within a range of 4000–400 cm−1 with a resolution of 4 cm−1; 200 scans were collected for each spectrum. The unmodified CPE was prepared by thoroughly hand mixing 30 mg of silicon oil with 70 mg of graphite powder (analytical grade, ultra F, < 325 mesh, from Alfa) in a mortar. A portion of the composite mixture was packed into the cylindrical hole of a teflon tube equipped with a copper wire, serving as electrical contact with the rest of the circuit. The surface exposed to the solution was polished on a weighing paper to give a smooth aspect before use. Purified Arabic gum modified carbon paste electrodes (PAG-CPE) was prepared as described in  for the bare CPE using 65 mg of graphite powder, 30 mg of silicon oil and 5 mg of pure gum powder. When not in use, CPEs were removed from the supporting electrolyte and stored at room temperature. 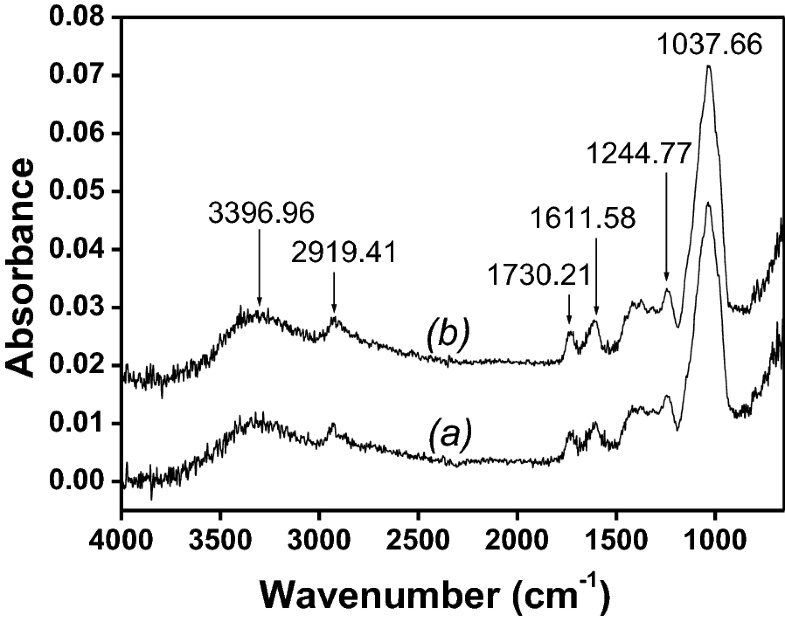 The FT-IR spectra of raw and purified Arabic gum are presented in Fig. 1. From Fig. 1, both spectra show the presence of a broad peak, characteristic of OH group in the region 3500–3200 cm−1, which describes the presence of alcohol, phenol or carboxylic acids . A second major peak observed at 2919.41 cm−1 was attributed to asymmetric and symmetric C–H stretching of aliphatic methyl and methylene. The peaks at 1730.21 cm−1 and 1611.58 cm−1 indicate the presence of carbonyl (C=O) of carboxylic acids and carboxylate, respectively. A sequence of minor peaks localized between 1500 cm−1 and 1244 cm−1 may come from the symmetrical bending vibration of alkane bonds (–CH2). Another absorption peak at 1244.77 cm−1 could be attributed to C–O, C–H or C–C stretching vibrations of carboxyl groups (–COOH). The peaks at 1037.66 cm−1 is probably due to the stretching vibrations of C–O of the alcohol on the glycosyl group . The region below 1000 cm−1 is the fingerprint zone and the absorption cannot clearly be assigned to any particular vibration because they correspond to complex interacting vibration systems . By comparing both spectra on Fig. 1, no significant difference was observed. Nevertheless, it was noted that the breadth of the band observed at 3396.96 cm−1 was more pronounced on the spectrum of purified Arabic gum (Fig. 1b) than that observed on the spectrum of raw Arabic gum (Fig. 1a). This justifies the fact that, the purification of Arabic gum has set free the OH groups by eliminating impurities which could be metal cations, and limits the possibility of OH groups to interact directly with flavonoids by reducing the voltammetric signal. 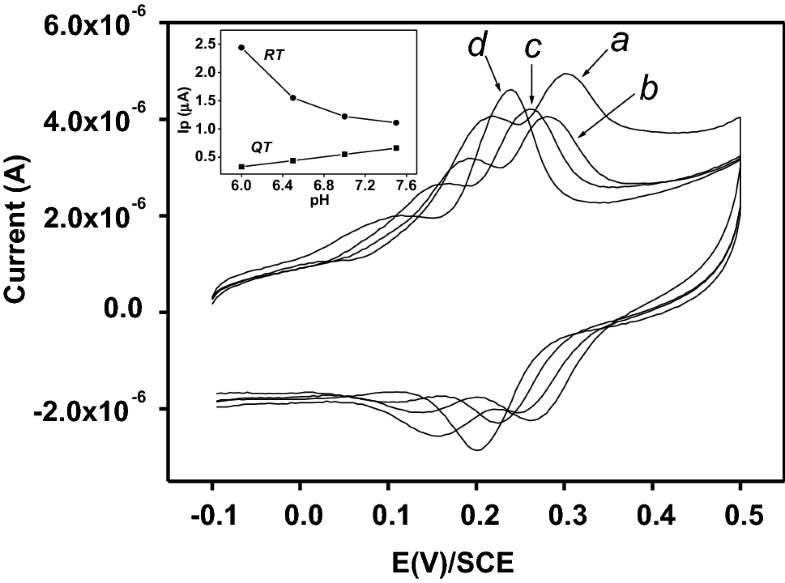 The electrochemical behavior of 0.99 µM for each QT and RT on different elaborated electrodes was studied by cyclic voltammetry in 0.1 M PBS at pH of 6.0. Figure 2 shows cyclic voltammograms obtained on different working electrodes. From Fig. 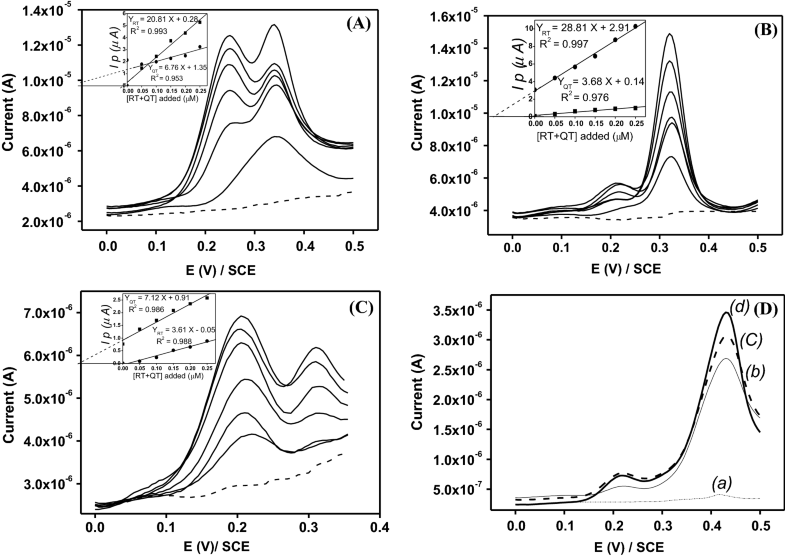 2, the signals of both flavonoids are more pronounced in terms of peak intensity and sharpness when electrodes are modified with raw Arabic gum (RAG) (Fig. 2c, d) in comparison with the bare CPE. These signals increase and become more important with the insertion of purified Arabic gum in the carbon paste (Fig. 2d). In fact, in comparison with the unmodified electrode, the gains in intensities were evaluated to be 2 for both QT and RT on RAG-CPE, 2.8 and 3.3 for QT and RT respectively on PAG-CPE. These results can be explained by the fact that, the presence of Arabic gum in the carbon paste increases both the real surface area and the hydrophilicity of the modified CPE as shown in our previous work . Moreover, the purification of Arabic gum could liberated the OH groups present at their surface, which become more available to interact with OH functional groups of flavonoids by increasing their diffusion and therefore the current peak intensities. 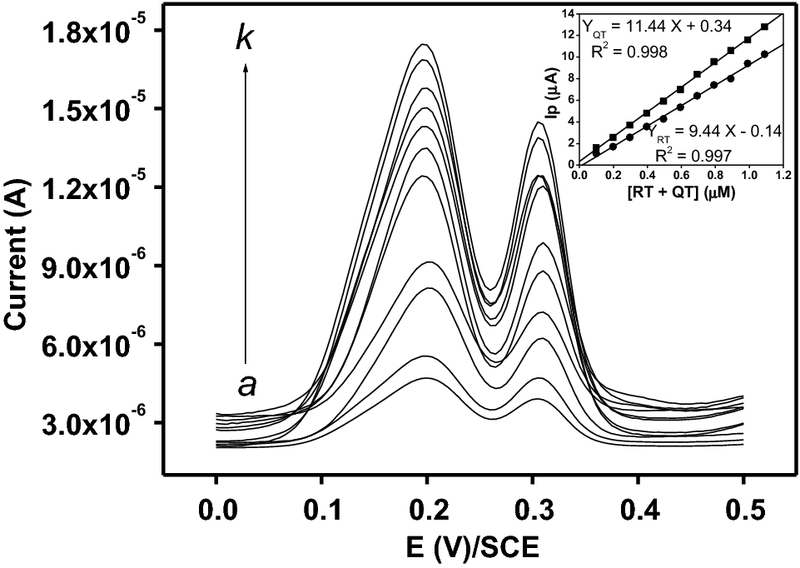 Oxidation and reduction peaks observed respectively at 0.18 and 0.22 V/SCE for QT and at 0.31 and 0.30 V/SCE respectively for RT on PAG-CPE are associated to reversible redox processes [12, 22] as shown in Scheme 1. The electrochemical response of both QT and RT on the PAG-CPE was affected by the pH of PBS. 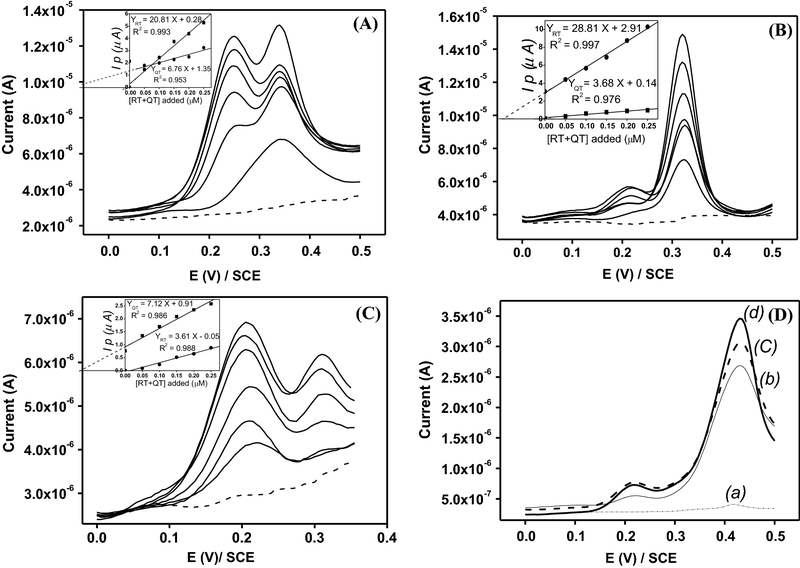 Figure 3 presents cyclic voltammograms of the purified Arabic gum modified CPE toward 1.09 µM for each QT and RT at different pH values ranging from 6.0 to 7.5. As seen in Fig. 3, the redox peak potentials were gradually shifted to negative values for both QT and RT when increasing the pH of the supporting electrolyte, indicating the redox reactions are accompanied by protons transfer. The numbers of protons and electrons exchanged during the redox processes of QT and RT are equal, and were reported to be two [12, 20]. It was noticed that the oxidation peak current of RT increases and that of QT decreases gradually when increasing the pH values. 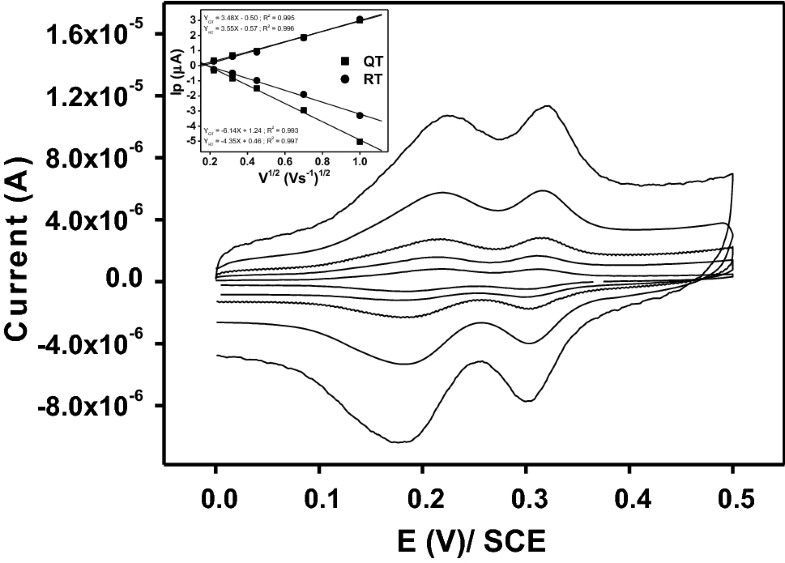 This result indicates that basic pH favor the electrochemical oxidation of RT and disfavors that of QT, simultaneously. This observation leads us to take into consideration the pH values of any matrices before the quantification of either QT or RT. By considering the simultaneous determination sensitivity, the pH value of 6.0 was chosen as the optimal pH condition and used in the subsequent experiments. The cyclic voltammograms of 0.99 µM of QT and RT on PAG-CPE at different scan rates were recorded in pH 6.0 PBS, as shown in Fig. 4. From Fig. 4, peak currents (anodic and cathodic) for both QT and RT increased linearly with the square root of scan rate (ν) from 0.05 to 1 V/s (inset of Fig. 4) and expressed respectively by the following equations: Ipa(QT) (µA) = 3.48 υ1/2 (V/s)1/2 − 0.50 (R2 = 0.995) and Ipc(QT) (µA) = − 6.14 υ1/2 (V/s)1/2 + 1.24 (R2 = 0.993); Ipa(RT) (µA) = 3.55 υ1/2 (V/s)1/2 + 0.57 (R2 = 0.996) and Ipc(RT) (µA) = − 4.35 υ1/2 (V/s)1/2 + 0.46 (R2 = 0.997). The obtained results indicate that a diffusion controlled process takes place at the electrode, which is the mass transport rate of both QT and RT to the surface of the electrode across a concentration gradient. SWV was performed to investigate the relationship between the peak current and concentrations of both QT and RT. Figure 5 shows that the oxidation peak currents were proportional to each concentration of QT and RT in the range from 0.099 to 1.090 µM. The regression equations were Ipa(QT) (µA) = 11.44C (µM) + 0.34 (R2 = 0.998) and Ipa(RT) (µA) = 9.44C (µM) − 0.14 (R2 = 0.997) for QT and RT respectively. The limit of detections (LOD) for QT and RT on the proposed sensor estimated using 3S/m, where S is the standard deviation of the intercept and m is the slope of the regression line [21, 22, 23] were found to be 0.029 µM and 0.058 µM respectively. A comparison of the results for the voltammetric determination of either QT or RT using other modified electrodes reported in the literature is given in Table 1. In comparison to other materials used as modifiers, purified AG exhibited a limit of detection in an acceptable range. Thus, the obtained detection limits of 0.029 µM (QT) and 0.058 µM (RT) are closed to those obtained with CPE modified by carbon nanotube , and even better than those achieved with GCE modified carbon nano tube . These results indicate that the proposed sensor is more sensitive than some previously reported. 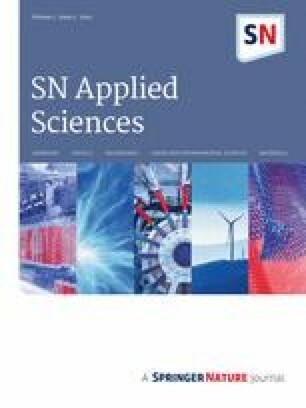 The principal advantage of the proposed approach is the availability and low cost of Arabic gum contrarily to other materials used as electrode modifiers like nanoparticles or carbon nanotube. The interference of some organic compounds on the simultaneous determination of QT and RT on PAG-CPE was investigated. The selected interfering agents were Aspartic acid (ASP), Gallic acid (GAL), Sucrose (SUC) and Tartaric acid (TAC). Indeed, a known amount of each studied species was added to a solution containing 0.99 µM of each QT and RT and the obtained solutions were analyzed using SWV technique. The obtained results are summarized in Table 2 (see Figure S1, Supplementary Information, for typical curves recorded). From Table 2, it is clears that all species interfere on the oxidation signal of QT and RT. It was noticed that selected agents interfered by decreasing and increasing the oxidation signal of QT and RT simultaneously. ASP, GAL and SUC were found to interfere slightly on the oxidation signal of both QT and RT. Nevertheless, the interference of tartaric acid was more pronounced on the signal of QT in comparison to RT and to others interference species. In order to investigate the applicability of the PAG-CPE sensor for the direct and simultaneous quantification of QT and RT, some local fruits such as orange, apple and onion were selected and tested. The simultaneous determination of QT and RT in the selected fruits and in spiked urine sample were performed by SWV technique on PAG-CPE using the standard additional method. Figure 6 shows SWV curves recorded on each natural juice and inserts give the relation between peak current with QT and RT concentrations. From Fig. 6, rutin was clearly detected in natural juices for orange and apple as revealed by the signal observed around 0.34 V/SCE on the first voltammogram (Fig. 6a, b). The obtained results were approved by the literature which reports an important presence of rutin in oranges and apples . The amount of rutin in the tested fruits, orange and apple were found to be 0.31 and 0.35 µM respectively. Simultaneously, no QT was found in orange, while an amount of QT 0.001 µM was found in apple. In onion juice (Fig. 6c), an important amount of QT 0.21 µM was detected, while the RT was found to be 0.03 µM. Human urine samples were enriched successively with 0.2, 0.25 and 0.3 µM of both QT and RT and their exacts amount were determined using SWV on PAG-CPE. The obtained results are summarized in Table 3 (See Fig. 6d, for typical curves recorded). All the samples were determined trice under same conditions. Recoveries of RT were in the range from 92 to 95% and those of QT were from 15 to 17% in human urine samples. Comparing both flavonoids, better recoveries values were obtained with RT, showing that this method could be effective and reliable for RT detection in urine samples. The poor determination of QT in urine samples may be due to the presence of some interfering compounds such as urea, creatinine or uric acid always present in the urine; which may interfere by reducing the voltammetric signal of QT. Obtained results show that the present sensor using purified arabic gum could be useful for the direct quantification of both QT and RT in natural fruits and for the successful detection of QT in the human urine. The obtained results showed that the use of purified arabic gum as modifier for a carbon paste electrode increases significantly the voltammetric signal of both QT and QT. The voltammetric signal in terms of sharp and peak current was well defined for RT in basic pH and became quasi-inexistent for QT. The elaborated sensor was first successfully applied for the quantification of both QT and RT in natural juices of some fruits. The same sensor was also applied for the simultaneous detection of QT and RT in the human urine samples, showing its use as a suitable tool for analyses involving real matrices. For future, a chemical functionalization of arabic gum will be investigated in order to improve its properties by therefore decreasing the LOD of the proposed sensor. The authors wish to thank the International Science Program (ISP) for financial support of the postdoctoral position of Dr. Serge MBOKOU through the African Network of Electroanalytical Chemists (ANEC). They also thank Dr Tchieno MMF for recording FT-IR spectra.